UNCASVILLE, Conn. — Leslie Robinson joined an exclusive club when she was drafted by the New York Liberty last month. The Princeton star is just the third player with Ivy League experience taken in the WNBA draft, joining former Harvard standouts Allison Feaster and Temi Fagbenle. While Robinson is a longshot to make the Liberty, she’s happy to have the opportunity. “It’s been great to learn from everyone and has been a really good experience so far,” she said. Coming from a conference known more for its academic achievements, Robinson is one of four Ivy Leaguers on training camp rosters this spring. She’s joined by Princeton’s Blake Dietrick (Atlanta), Fagbenle (Minnesota) and Columbia’s Camille Zimmerman (Minnesota). Robinson had no idea whether she’d get drafted. 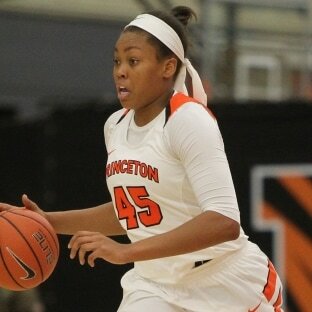 She was watching with her Princeton teammates and started to cry when her name appeared on the screen in the third round. While she was fortunate to see her name on TV, her dad wasn’t so lucky. Former Oregon State men’s basketball coach Craig Robinson, who is now the Knicks vice president of player development and G League operations, missed it because the television in his apartment didn’t have ESPNU. That channel carried the second and third rounds of the WNBA draft. Robinson’s wife wasn’t the only one who reached out to the Princeton grad and former fourth-round draft pick of the Philadelphia 76ers. He got a text from his brother-in-law — former President Barack Obama. An avid basketball fan, Obama went to Princeton’s 2015 NCAA Tournament game in Maryland during Leslie Robinson’s freshman year. Leslie Robinson played Monday night in the Liberty’s exhibition loss to Dallas. She had two points, two rebounds and drew a charge. “When they came to school, that’s when I started really watching them,” she said. Now she’s a member of the defending champions’ roster, playing alongside Lindsay Whalen, Sylvia Fowles and Seimone Augustus.